The Nao Santa María is one of Huelva’s hallmarks and its columbine vocation. It suggests and evokes the region’s ships, seamen, the seafarer’s tradition and its most universal history. All over the world it is recognized as a symbol of this history of encounters and mutual awareness which the province of Huelva celebrates now on its 525th Anniversary. 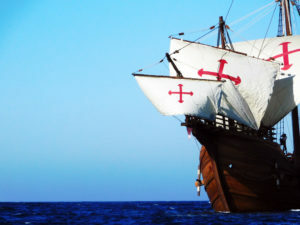 Hence the Nao Santa María Project embodies the goal of the 525th Anniversary of retracing its history to promote the columbine heritage, the tourism and the regional culture through the construction and cultural promotion of the vessel that was the vehicle of this encounter between two worlds 525 years ago, and will be again in the present. 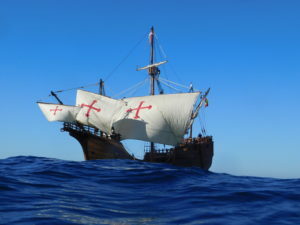 Once the Nao Santa María is into the water, she is the perfect ambassador of the 525th Anniversary and the province of Huelva in all the Spanish, European and American ports that the ship will visit on its promotional tours in the next few years. It is for all these reasons that on the frame of the 525th Anniversary and with the support of the Provincial Council of Huelva and the Cajasol Foundation, the Nao Victoria Foundation has built the replica of the historical Nao Santa María. The Nao Victoria Foundation is an institution specialized in promoting and enhancing great cultural events through its historical ships. 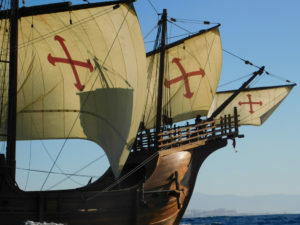 The Nao Victoria and the Galeon Andalucía, to name two of its best known vessels, have already sailed to ports all around the world developing far-reaching projects, participating in International and Universal Exhibition as well as other events with great success in public attendance and media coverage.